The annual Economic and Social Survey of Asia and the Pacific is a valuable instrument for disseminating information and sharing experience on socio-economic performance and related policy responses. Given the dynamic role which the region is playing in an increasingly globalized world economy, this forty-ninth issue is particularly important. Economic performance in Asia and the Pacific during 1994 and 1995 has been striking. Average rates of growth in output and trade were far above the world average. A critical factor for the continuance of today’s favourable trends will be the sustained commitment of countries in the region to domestic policy reforms. These include enhancing the role of the private sector in development, strengthening legal frameworks, macroeconomic reform and institutional mechanisms for collaboration between government and the private sector. All these are examined in the Survey as are the important issues of property rights, enforcement of contracts, and policies to enhance competition. While energizing the private sector, countries in the region continue to emphasize the vital role of the public sector in the provision of social services. In most countries, the proportion of public expenditure allocated to social sectors has exceeded 20 per cent. Considerable improvements have been made in education, health, water supply and sanitation over the past decade. There are still several areas calling for even greater attention. These relate, among others, to equity between income classes, regions and genders. They include cost-effectiveness in delivery and intrasectoral priorities. Improvements will be necessary in the quality of services. Closer involvement is required with the private sector, non-governmental organizations and local communities. Greater mobilization of resources for the social sectors will be essential. And it must be remembered that the remarkable progress of the region has not benefited all its countries and peoples, many of whom remain among the world’s least developed. 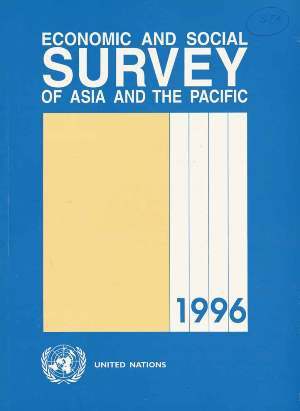 The Survey is an invaluable source of information on economic developments in the Asian and Pacific region. It will serve as a reliable resource for policy dialogue at national and regional levels and as a model for the entire international community.